Sometime rebuke is necessary, but it must be used with caution. The purpose of any rebuke, confrontation or discipline is to help people, not hurt them. 1. BE FIRM AND BOLD. 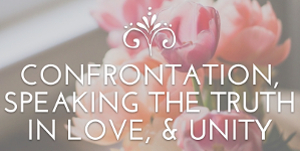 CONTINUE READING: Principles Of Confrontation. Scripture clearly tells us that we must be gentle and caring in these situations but it is difficult at times. Thanks for sharing this inspirational blog, Bill and Teddy.